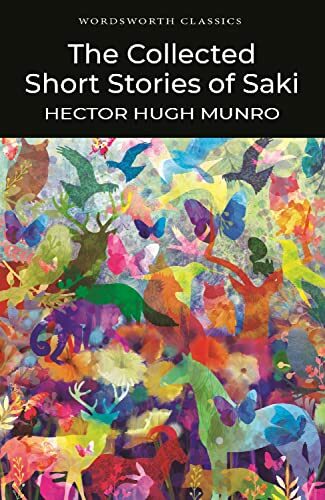 Saki is the pen name of Hector Hugh Munro, an English writer I first heard of when my daughter was assigned one of his stories for her high school English class. She insisted that I'd like this one. I do like him; his stories tend to punish the pompous and favor children and other underdogs. Highly ironic and often humorous, they are very short and generally end with a punchline of sorts. I haven't (yet) read this entire collection. It contains around 100 stories, and I'm not inclined to read them all at once. They're kind of like little snacks--it's nice to read one or two when the mood strikes. I'm keeping it in the kitchen. They're kind of like little snacks - lovely description. That's exactly what they are! Never heard of Henry Hugh Munro. Library in NL has none of his books. Wonderful that your daughter's English teacher choose someone unique to study the 'short story'. I remenber we only read O'Henry. I rarely read short stories but have decided to start Dubliners ( Joyce), Armenian Sketchbook ( Grossman) and your favorite Prague Tales ( Neruda). I'd never heard of him either, which is odd considering how prolific he was. I've read some of Dubliners but haven't finished it--I enjoyed what I've read so far, though, surprisingly, since my only previous exposure to Joyce was A Portrait of the Artist as a Young Man in high school, which I hated, lol. Google some pictures of the Charles Bridge and Prague's old town to look at while you're reading Prague Tales. The atmosphere is wonderful. I've not heard of Armenian Sketchbook or Grossman before--off to find them on Amazon!